The metaphor of a journey represents the idea we want to convey through this site. People become interested in cross-cultural issues for different reasons, have different starting points and seek different destinations. Along the way, some take detours or change direction. The map and tour brochure concepts reflect this metaphor. 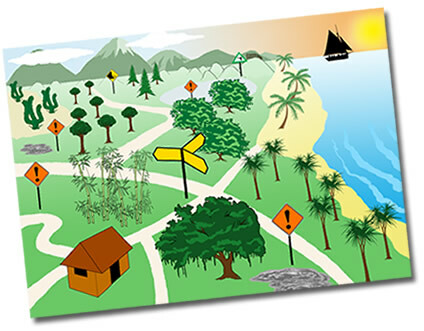 The icons on the map such as signs, the hut, the trees and so on will appear on different pages and are intended to help guide you on your journey.